Many of Colorado’s custom home builders are using reclaimed wood for structure, architecture, and design. More and more companies are committing to reduce, recycle, and reuse by utilizing reclaimed wood whenever they can! Nothing is off limits when it come reclaimed which is why it is so unique. With everything from old wine crates to entire buildings there is quite an abundance of reclaimed wood to be salvaged in Colorado alone. Today’s custom home builders are really showing off their creative side by finding some very innovative ways to use reclaimed wood throughout their homes. In the past garage doors were not considered a decorative element to the outside of your home. Now a days, with available materials like reclaimed wood, this is not the case. Driving through custom home neighborhoods you will see that there are many types of garage door looks to choose from. Reclaimed wood garage doors have become quite an eclectic addition to all types of houses. Because reclaimed wood looks great with stone, brick, stucco, and other exterior materials it is a great choice to amp up any homes curb appeal. From a sleek modern design to the rustic vibe of a barndoor look a reclaimed garage door is beautiful and will last for decades. Custom home builders are bringing a lot of attention to ceilings by using reclaimed wood. Often overlooked the ceiling of a room can really add to its ambiance. The height, angle, and texture of a ceiling can drastically change the acoustics, lighting, and overall feel of a room. Reclaimed wood can be used with cathedral ceilings, flat horizontal ceilings, coffered ceilings, multi-level ceilings, and many more. Just like with the exterior reclaimed wood can be mixed with many other materials for a dramatic effect and the same is true on the ceiling. Colorado custom home builders have captured mountain décor by using reclaimed wood as decorative accents like backsplash. Reclaimed wood paired with a granite countertop is extremely elegant while still giving a natural look and feel. Reclaimed wood beams are one of the mightiest items that you can put in your home! They can also be one of the most challenging. Reclaimed wood beams can be installed on the ceiling or vertically from floor to ceiling. Either configuration really gives a majestic feel to living rooms, dining rooms, and kitchens. We are not talking about a simple covered deck! These covered spaces have high rounded vaulted reclaimed wood ceilings, dramatic stone fireplaces, stone and/or brick pillars, and even custom bars that look like they should be indoors. For a material that is hundred upon hundreds of years old worn by time and the elements, reclaimed wood is one of the most spectacular building materials available. Even if you are not designing a new home build you can add many of these features to your existing home for some theatrical effect. If you love reclaimed wood and want to incorporate it into your home, it can be intimidating. 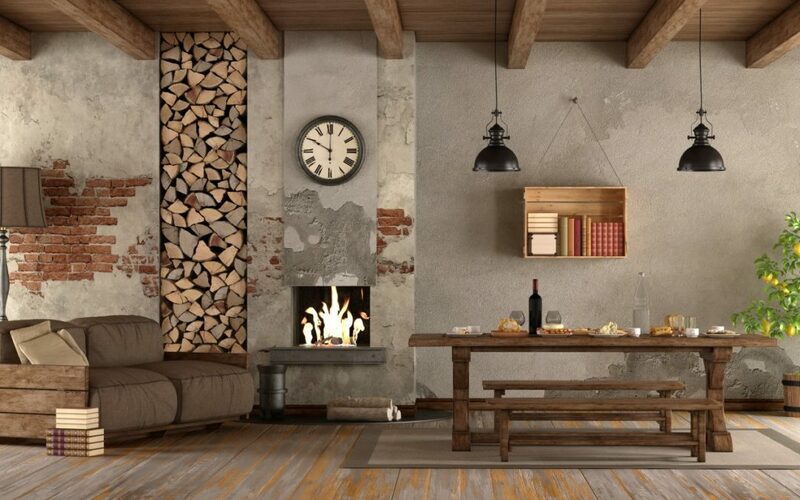 However, reclaimed wood is so versatile and goes with really ANY décor you cant go wrong!